Richard Sherman has called on the NFL to dismiss the new helmet rule immediately, branding it "idiotic" during a Twitter outburst on Sunday. NFL owners approved the introduction of the rule, which means it is a foul for any player to lower their head and initiate contact with their helmet against an opponent, back in May. The policy change – which will see a 15-yard penalty called on the offender, with the referees also having the option to eject the culprit – was made to improve player safety, though it has led to confusion during the preseason. 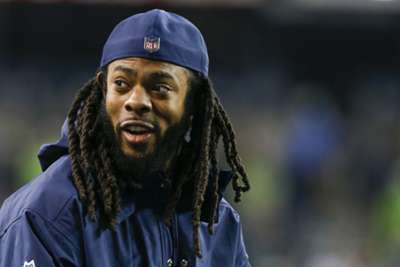 Sherman - preparing for his first season with the San Francisco 49ers after he was released by the Seattle Seahawks - made clear his feelings on the subject on social media. The cornerback began with a tweet that included a post from Brett Tessler, an NFL agent representing 49ers running back Raheem Mostert, who was penalised for a tackle made in a game on Saturday. Tessler questioned an unnecessary roughness call against his client for leading with the head, with Sherman claiming it was impossible not to lead with the head when attempting a challenge. "To all those ppl [sic] including those who made the rule. I want a video of YOU running full speed and being lead by anything but your head while also attempting to bring down a moving target," he wrote. "You will soon realise it's impossible." He then continued to air his views in a further tweet, stating: "There is no 'make adjustment' to the way you tackle. Even in a perfect-form tackle the body is led by the head. The rule is idiotic and should be dismissed immediately. When you watch rugby players tackle they are still lead by their head. Will be flag football soon." Sherman also posted a link to a YouTube video of tackle being made in rugby, making note of how such a technique was considered ideal for that sport, yet "would be a for sure penalty in our league". The 49ers have two more preseason fixtures - against the Indianapolis Colts and Los Angeles Chargers - before they open their regular season campaign against the Minnesota Vikings on September 9.